Lights play a big part in a celebration of Christmas and the Holidays. From wacky homes displaying the cheesiest displays to professional over-the-top spectacles … once we see that first strand of lights go up, it’s hard NOT to be in the Christmas spirit. Even if it’s that kooky neighbor next door with his blow up Santa Claus and 25 of his other blowup friends. Just the thought of a steaming hot cup of chocolate cupped in my gloved hands, my wool cap on my head, my favorite fluffy scarf wrapped up tight, and the sight of my breath as I soak up the seasonal spirit makes me smile. And unlike that crazy neighbor down the street, there’s one holiday event/attraction in Wichita that continues to bring visitors back year after year. That display is Illuminations at Botanica. Illuminations is a family-friendly event that showcases Botanica’s eleven acres of beautiful gardens in a completely different light. It has become one of the area’s premier holiday events. However, this year the event is getting a festive facelift! With hundreds of thousands of lights and new themed displays, Illuminations will be Kansas’ largest holiday light display. More than 5,000 new LED luminaries will line garden pathways, more than 120 trees will be expertly lit, and many structures will be lit with twinkling white lights. 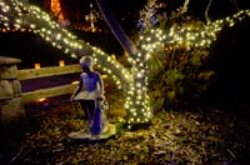 As visitors enjoy their walk through the gardens, they will enjoy the warm glow of luminaries, the sound of electric trains traveling around pine trees, the reflections of trees on the pond, the magic of the flocked forest at Candy Cane Lane, the fragrance of chimineas, the warmth of hot cocoa and cider, and the joy of live musical groups. In total, hundreds of thousands of lights combine with nature to create a stunning atmosphere and a “HO, HO, HO” lot of holiday fun! And if you’re lucky … you may just get to see that jolly ol’ St. Nick while you’re there. Support from special events such as Illuminations help showcase the Gardens and maintain Botanica as one of the Midwest’s leading botanical gardens. Come see why Illuminations is Kansas’ largest holiday light display and an event that keeps bringings families back year after year. Check Botanica’s website for ticket prices and hours of operation. 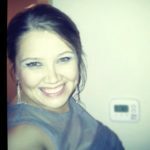 Amanda is a freelance writer and blog owner of: The Procrastinating Mommy – a PR friendly family blog. You can also follow her on Twitter at: @Amanda_aka_Mom. Disclosure: My husband and I received complimentary passes to Illuminations at Botanica. However, all thoughts and opinions are my own. Previous Post: « Louie: A Parent's Secret Weapon in Cambridge, Mass.